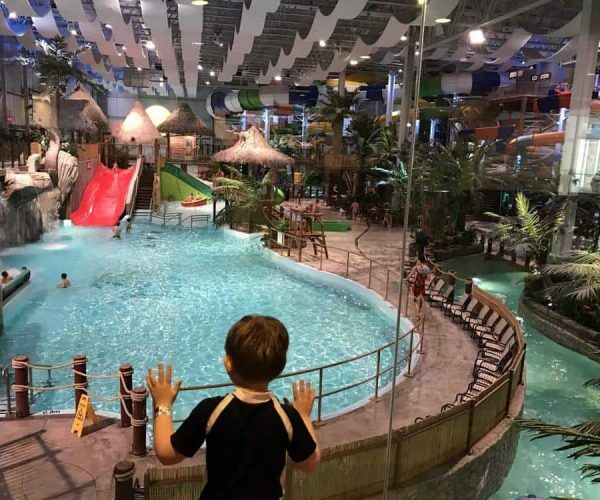 After spending a few days in Old Quebec City, we wanted to head out of town to play in the snow and hit their massive indoor waterpark, Bora Parc Valcartier. With multiple snow parks in the area, it was hard to choose. 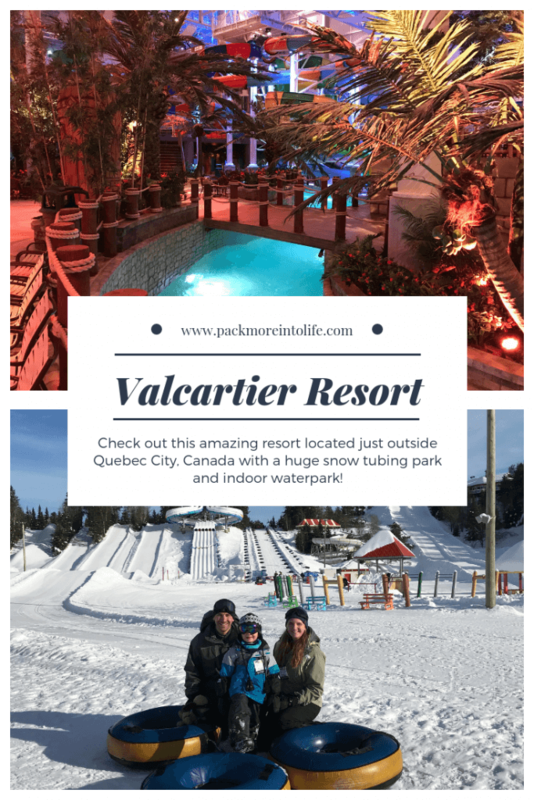 What stood out about Village Vacances Valcartier was the tubing tracks, kid friendly indoor waterpark, family friendly accomodations and location (only 30 minutes from Quebec City). Where is Village Valcartier located? 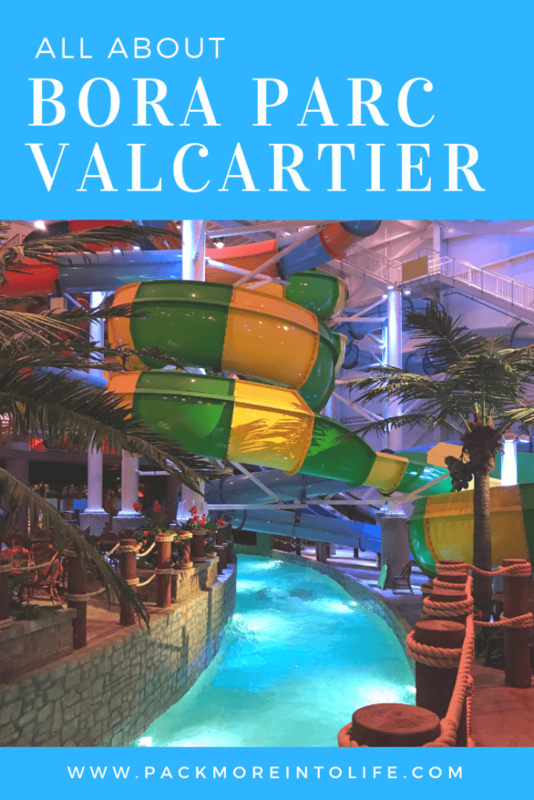 Valcartier is located only 30 minutes drive from Old Quebec City. With its free parking and location, it makes it an easy day trip or extension of your travels. We wanted to stay on the property because there was plenty to enjoy for two full days! We booked a King Suite which featured a one bedroom hotel room with murphy (fold down) bed for our son in the living room area. Our room was located on the 5th (top) floor and faced the parking lot (which was a bit of a bummer). The room was comfortable for our two night stay and we had ample room for the three of us and our winter gear. We really liked the multiple hooks near the door to hang coats and tile flooring to place our boots. The room also featured a mini fridge and coffee machine (with enough coffee for a couple of days). Sugar and creamer were provided, along with hot chocolate for those of us non-coffee drinkers. 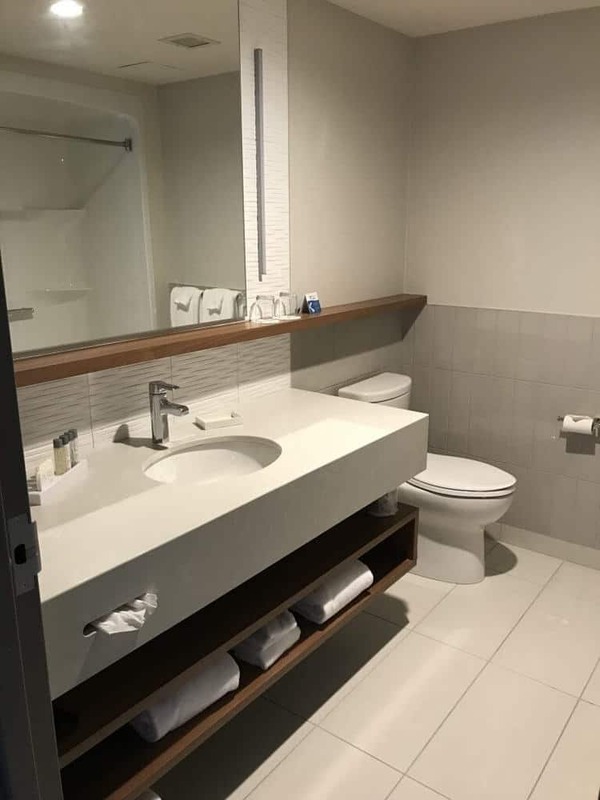 The bathroom was located in the center of the suite with a large vanity, complimentary bath supplies (shampoo, body lotion, soap), as well as a large tub (perfect for kids). In the back of the suite was the master bedroom with king size bed, luggage storage, cabinets for hanging and non-hanging items and an additional TV. The beds were comfortable, the linens were soft and crisp and plenty of pillows were provided. The towels in the bathroom were soft and absorbent. We did not elect to have service in our room due to our short stay, so I can’t comment on the staff in that department. The ladies at the reception desk were all polite and helpful. We arrived around 9am so that we could get ready for snow tubing and they allowed us to head up to our room since it was ready. We were very appreciative to be able to come up to our room after a full day of snow tubing. 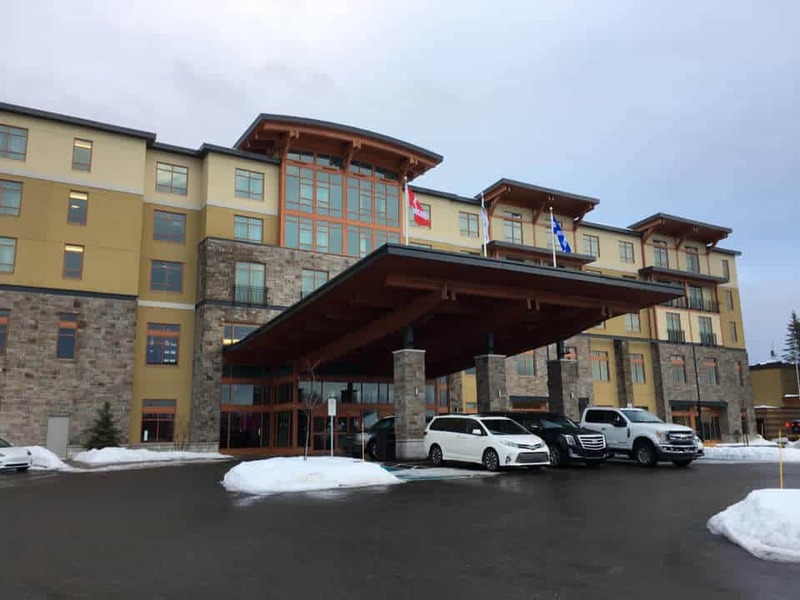 Parking is free for Village Valcartier hotel and non-hotel guests. But there is an additional parking lot for hotel guests, just use your key to enter and exit. 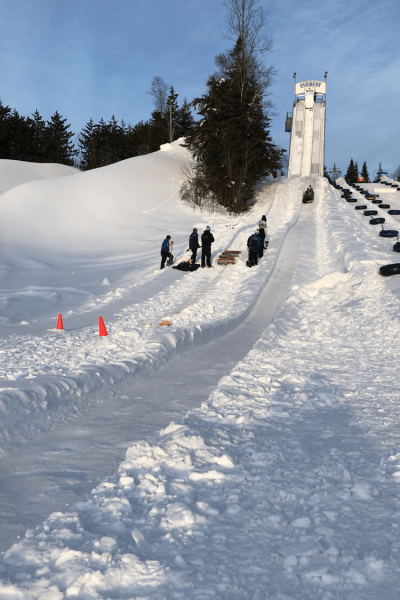 Want to stay at Valcartier? 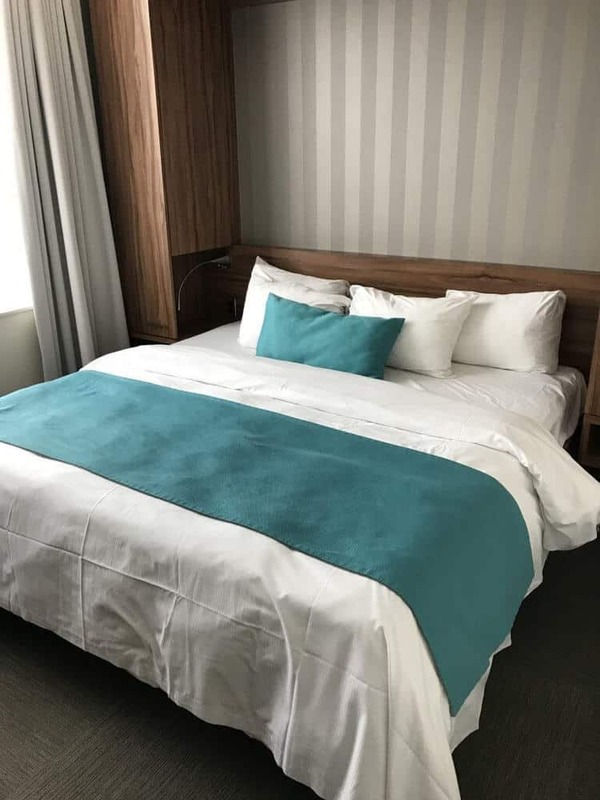 Head over to booking.com to check out their rates and deals for your stay! Or click the link below. 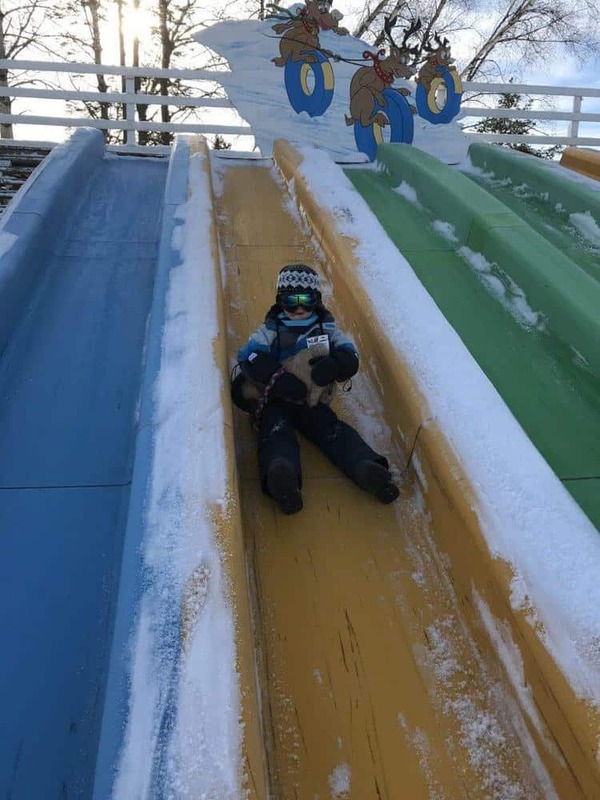 We arrived early on our first day to be in the snow tubing park before it opened at 10am. 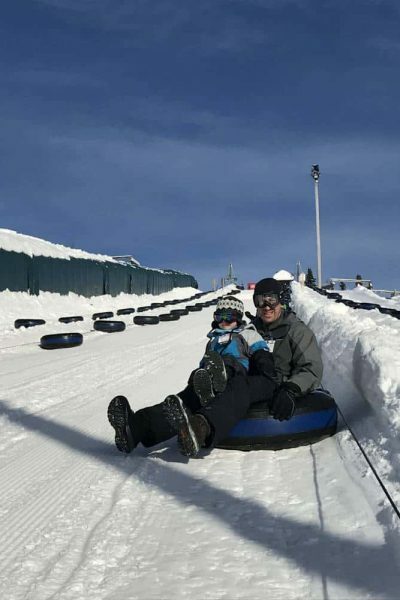 We were there on opening weekends and we assumed that the snow tubing park would be busy on Sunday. We assumed wrong, it was very quiet for most of the day. 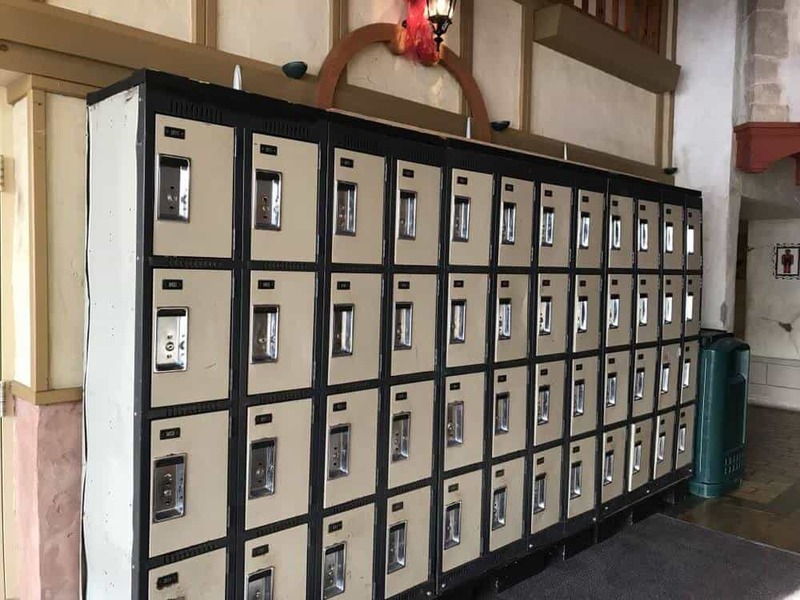 If you are staying as a guest at the hotel, wait to pay for your tickets until you arrive. 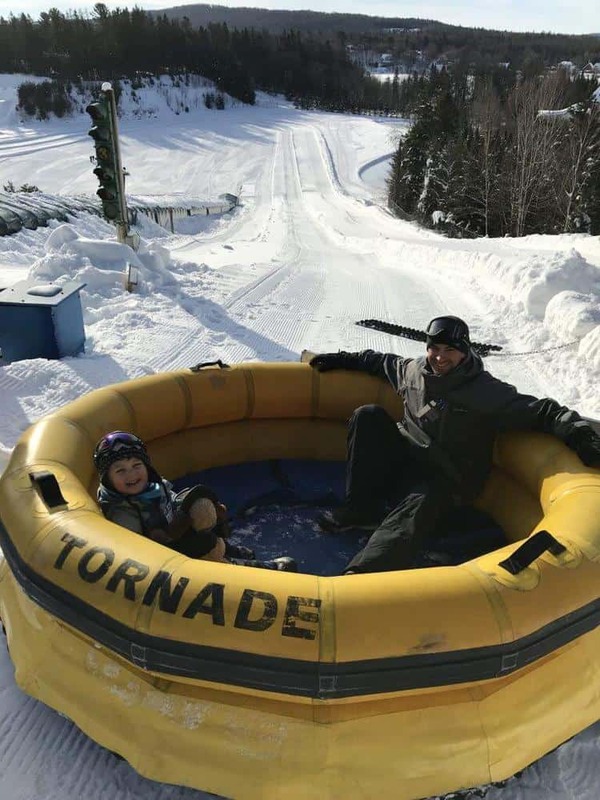 Go to the Reception desk and you’ll get 10% off your snow tubing and indoor water park tickets. You can also get a combo ticket if you plan to do both activities in one day. Once we had our snow tubing tickets and all of our gear, we walked down the right corridor to the entrance of the snow tubing park. 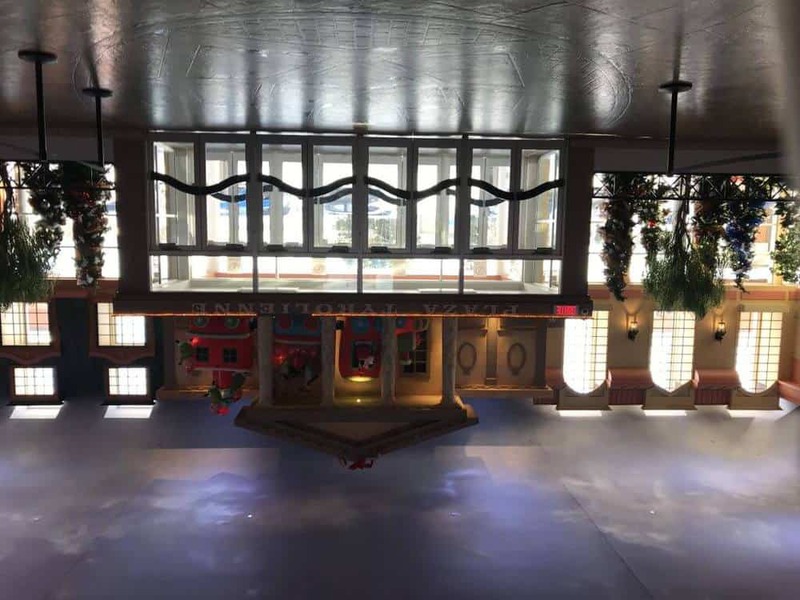 This indoor area features multiple restaurants, general stores, lockers and picnic areas for large groups. This is also the area where you will purchase your tickets if you are not staying on property. As soon as 10 am hit, we were ready to go and the first group headed out to play. A staff member checks for your ticket (attached to your coat) and then you can walk out to the right. Grab a snow tube and start walking to the lifts. Since we were one of the first groups into the park, we were a bit confused on what we were doing, so I’ll help explain. The lift system to the top of the hill features inner tubes that you sit inside (while holding your own tube). You can have max one adult and one child inside the tube on the way up. At first, we put our son on his own, but later switched to riding up with him and holding two tubes. The tube you are holding works great as a foot rest for the ride up. As for getting off, try a couple different techniques because the lift doesn’t stop moving. We usually just went down to one knee, helped our son stand up and then started walking. There is staff to stop the lift if you need an extra minute (but hold on tight because when the lift starts again it’s quite the jolt). The first lift takes you up to an area with multiple tube slides ranging from easy (green circle, blue square and black diamond). 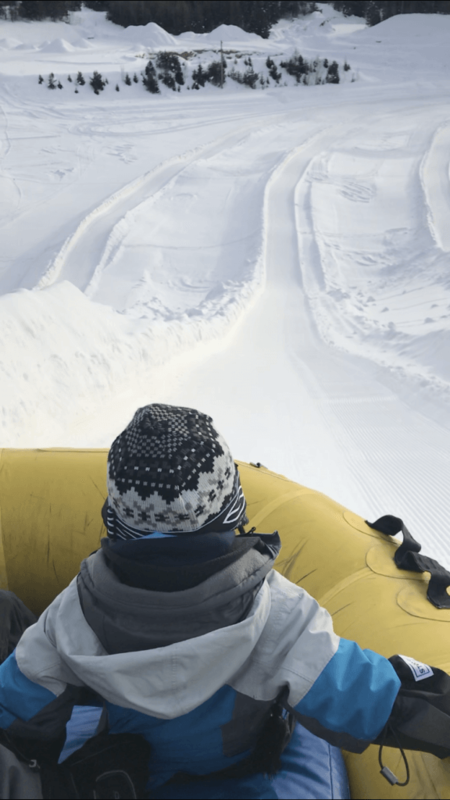 If you ride the second lift (on your right), you’ll reach a higher area with multiple styles of snow tubing and rafting. This was our favorite area. 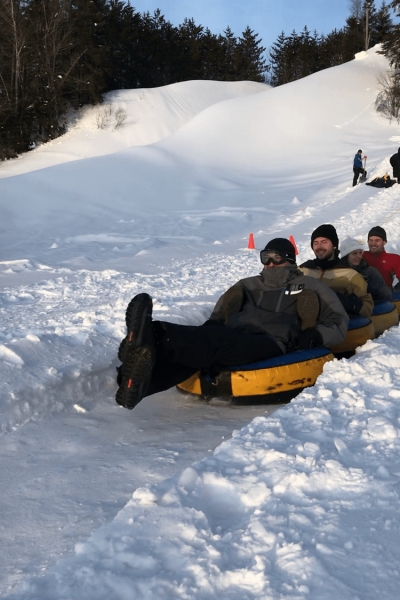 The snow tube tracks were long, steep and fast! We also really liked the tornado raft and 12 person raft that flew down the hill. If you are a smaller group like my family, you’ll need some extra people to ride the raft. The minimum is four riders and the max is fourteen. The staff was helpful in pairing up multiple smaller families and everyone worked together to drag the huge rafts back to the lift to carry them up to the top. The tornado was our favorite. You would push the raft up to a bar, then hop inside. The staff from the control tower would ask if you spoke English or French (you’d raise your hand) and then they would start the announcement in the appropriate language. Grab on tight and they would release the handle. From there, your raft would go spinning down the snowy hill to the bottom. Lots of laughs and giggles as we flew down the hill! We also rode down the black diamond tracks in this area. There was separate lift to carry us back to the top. I’m a daredevil, but even my heart skipped a beat a couple of times. We always went down as a set of three (usually with my son in his own tube). During the busier season, there is a full service restaurant at the top with bathrooms. It was closed during our visit, likely due to the lack of people to keep it open. Looking for more thrills? Head over to Everest (1.32 meter or taller). You’ll be paired up (if you are a single rider) with a couple of people to enjoy the steep drop. I asked my husband to check it out while I stayed at the bottom to watch with our son. My husband said to be sure to hold onto the person behind you by their feet! Then off you fly! It was a great thrill! 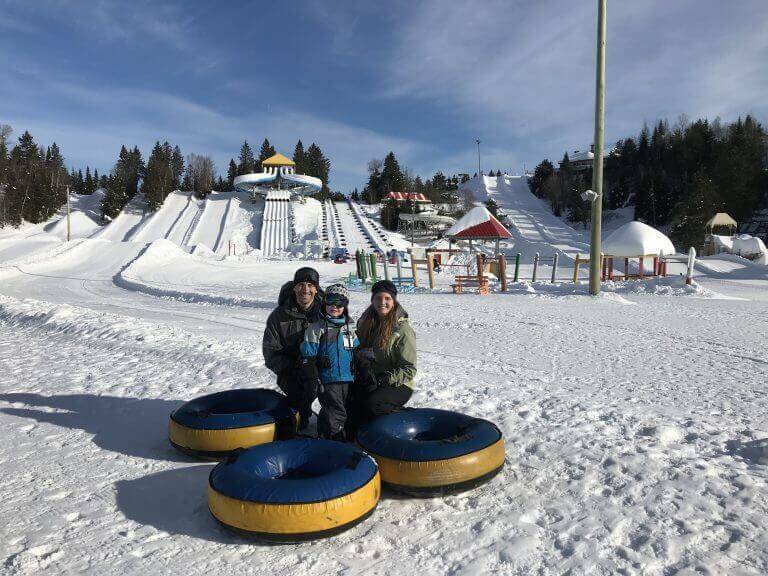 We really enjoyed the snow tubing park! 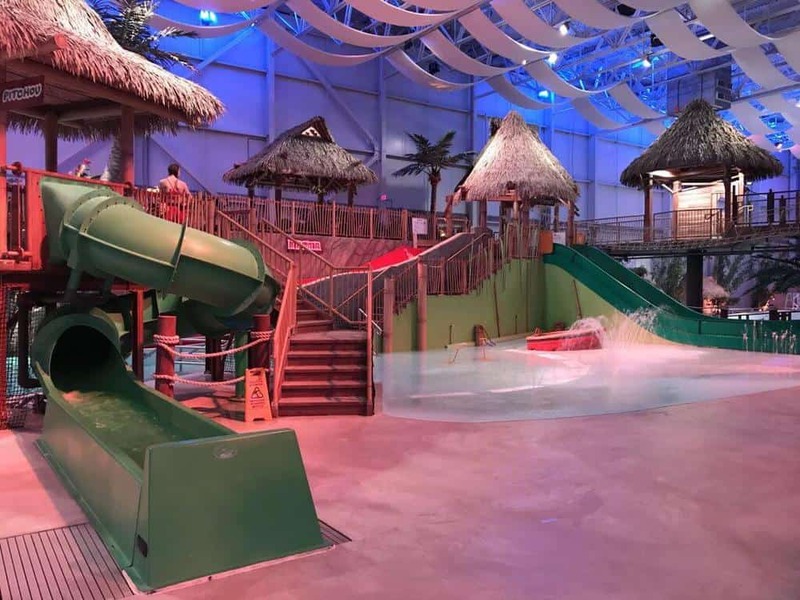 The variation was perfect to keep any group happy and we thought the staff was helpful as well as safety conscious. We did not have to wait in any lines as the park wasn’t very busy for a Sunday on opening weekend. I did read that school groups like to come during the weekdays, so something to note. 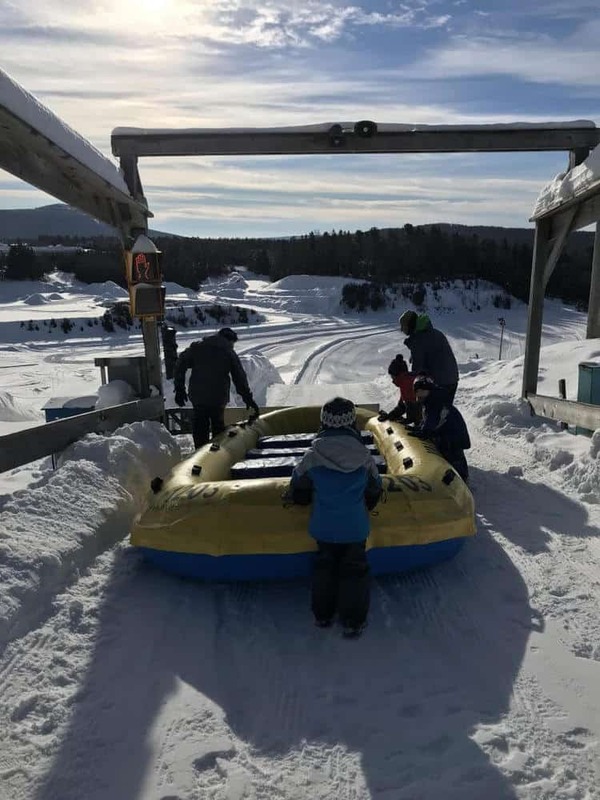 Check out the Valcartier website for details on which inner tube and rafting tracks are best for which ages. Looking for a fun place for the little ones to play? Check out the children’s zone. During our visit, it was located just past the inner tube pick up zone, near the ice skating. 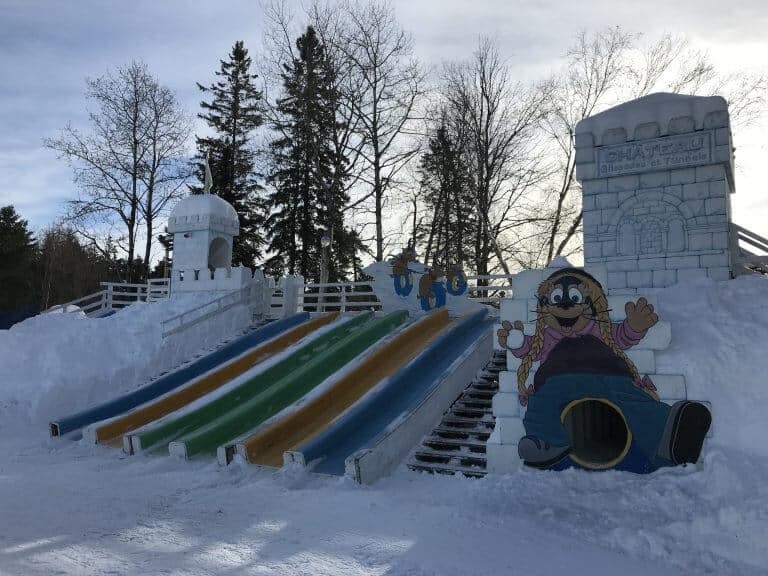 On the Valcartier website, it shows it just behind the hotel. So it’s worth asking when you arrive. Here is a link to their Winter Playground map. My son really enjoyed taking a break between snow tubing to just be a kid and play, run around and have snow balls fights with us. Most of the time we had the whole playground to ourselves. 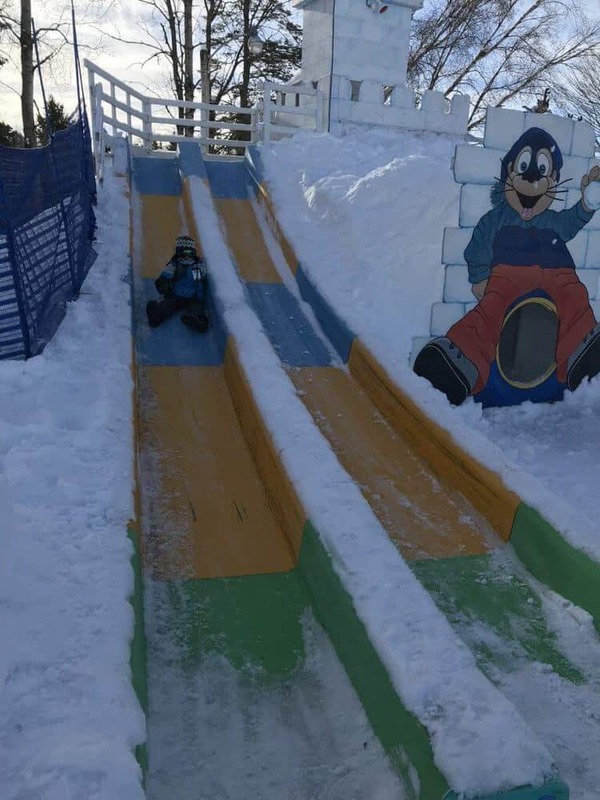 With multiple slides, tunnels and lookouts, it was a great place to have some snow fun. 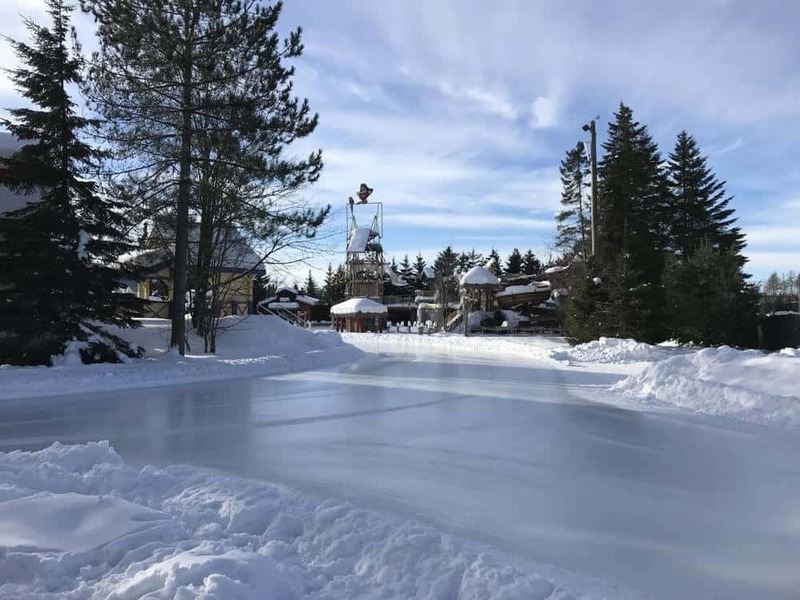 Want to enjoy some peaceful ice skating? Then the Valcartier Hotel is the place to do it! With its 1km track winding through the forest while enjoying music, it doesn’t get much more romantic than that! Head over to the rentals desk to pick up your ice skates. Cost is $4.95, or bring your own skates. If you are staying at the hotel, be sure to grab a free ice skating pass. We didn’t realize we needed anything and I had to rush back to the reception area to grab the passes. You’ll enter the ice skating area at the far right doors (as you enter the building). An attendant will check with a skate tag and then you are off to explore the track. 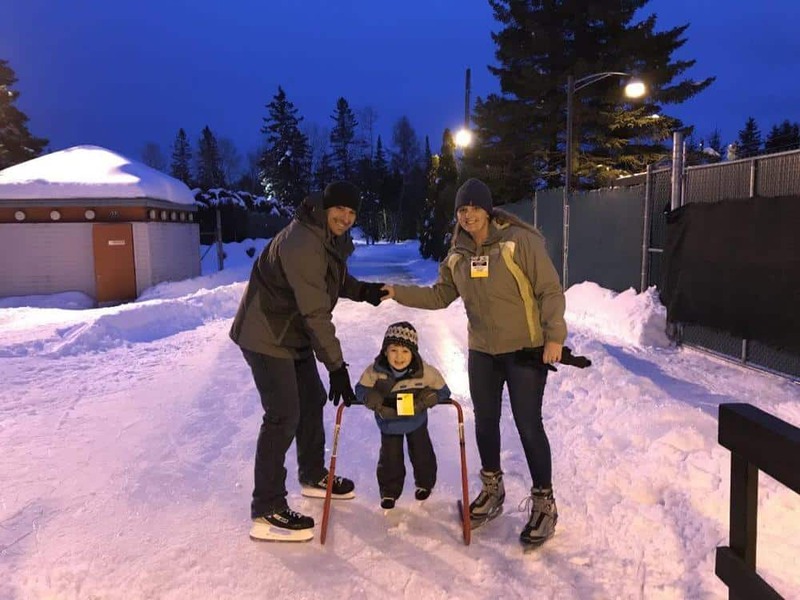 This was our son’s first time ice skating, so we lasted about five minutes. At least we tried! 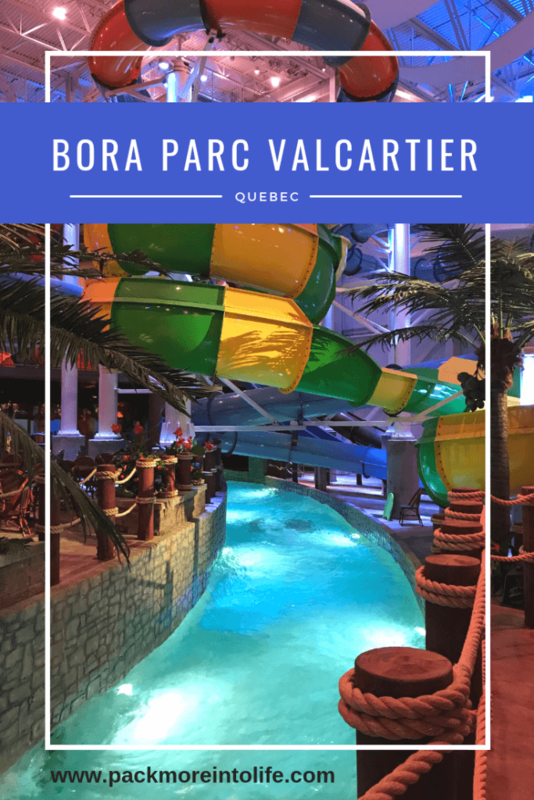 If you are looking for warm, clean and adventurous water park, Bora Parc Valcartier will meet all of your expectations! Best of all, it’s indoor, so it can be enjoyed year round! 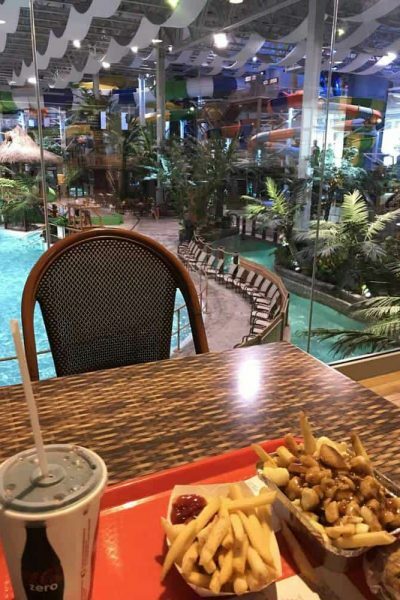 We certainly felt like we had stepped into a tropical paradise with over 14 slides, a lazy river, wave simulator and multiple pools to enjoy. Just a heads up that Bora Parc has a ticket system that involves a day ticket versus an evening ticket. If you know ahead of time, you’ll be able to plan ahead and make the most of your visit. If not, you’ll join the group of visitors that left negative reviews on Tripadvisor. Here is the deal, there is a day ticket from 10am-4pm. Then there is an evening ticket sold from 5pm-9pm (at a discount rate). 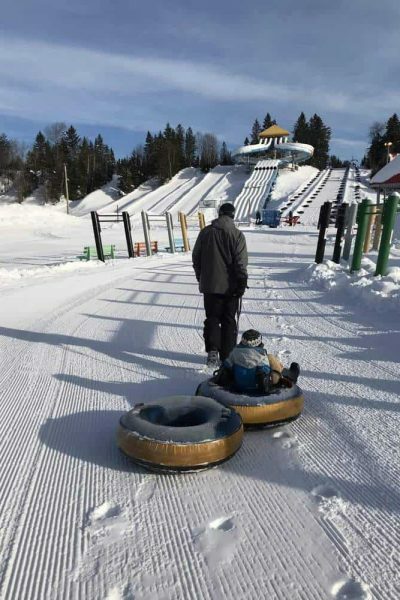 The evening ticket is great for visitors who want to check out the winter snow park during the day and then warm up at Bora Parc for the evening. 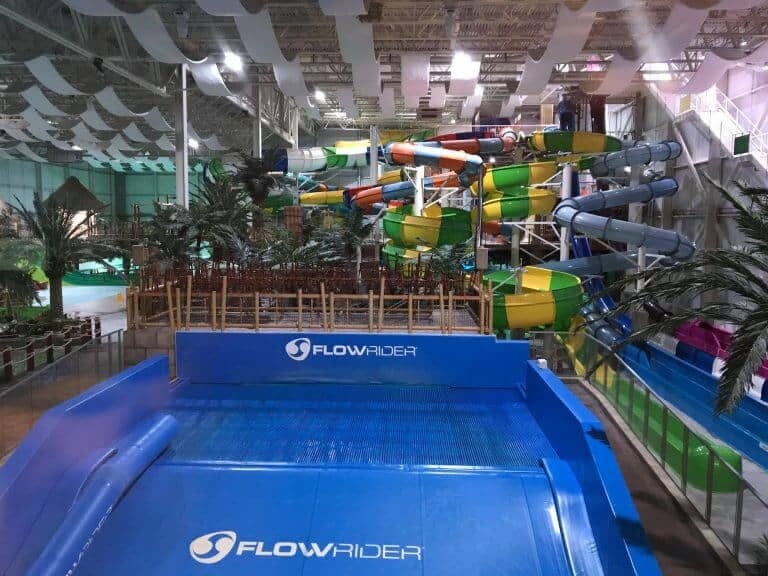 The Valcartier website also sells combo tickets for both the winter park and the water park (must be used the same day). Be sure to check the website for ticket prices and times. 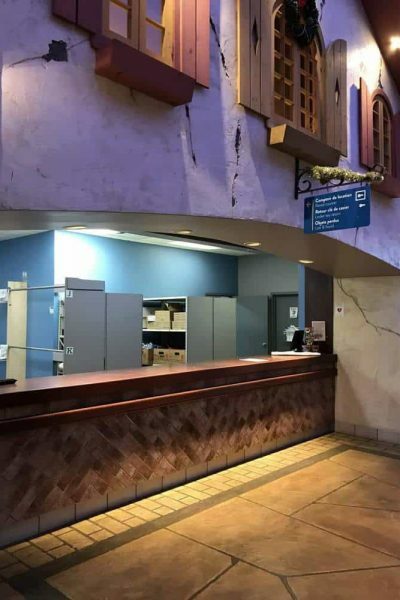 Since we were staying at the Valcartier Hotel, we purchased our Bora Parc tickets (at a slight discount) at the front desk. They also gave us plastic tokens for free towel rentals. 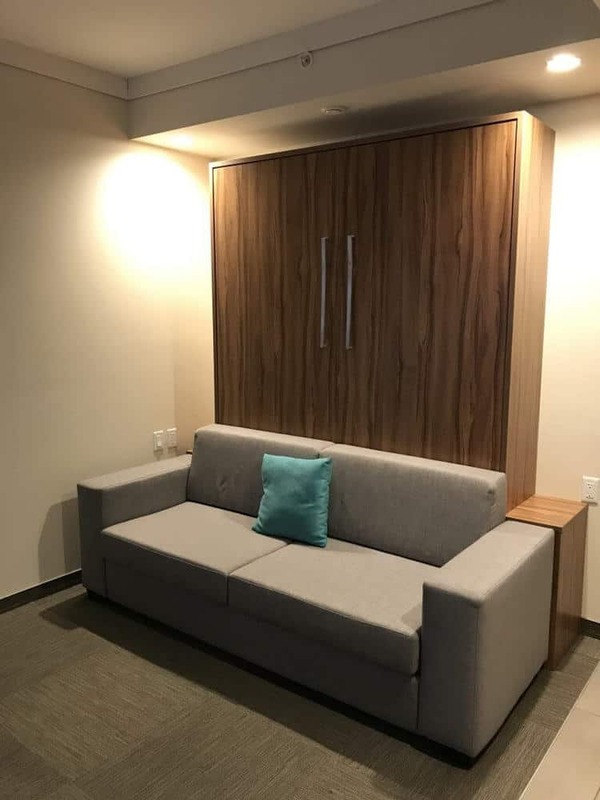 Once you enter the Bora Parc, you’ll find a communal changing area with lockers (additional cost), gender specific bathrooms, showers and plenty of changing rooms. 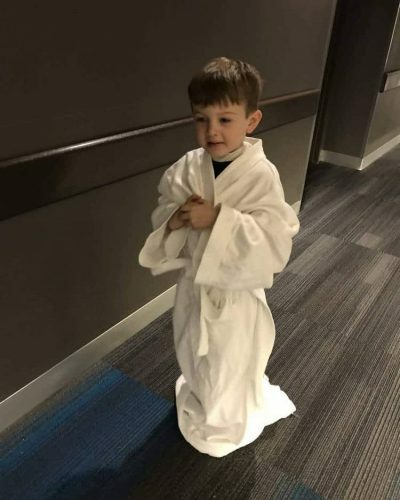 Since we were staying in the hotel, we just changed in our rooms and borrowed the robes before heading down to the park. 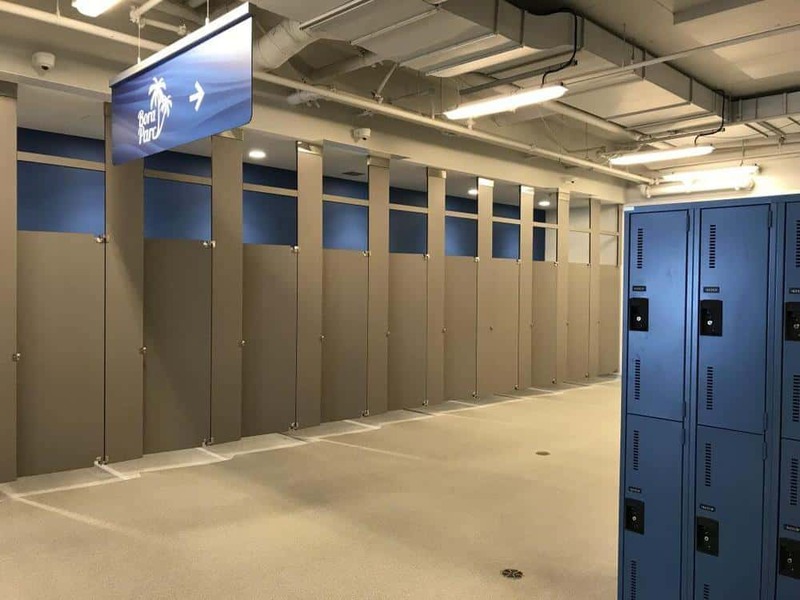 If you need towels, the towel station is right before you enter the changing area. 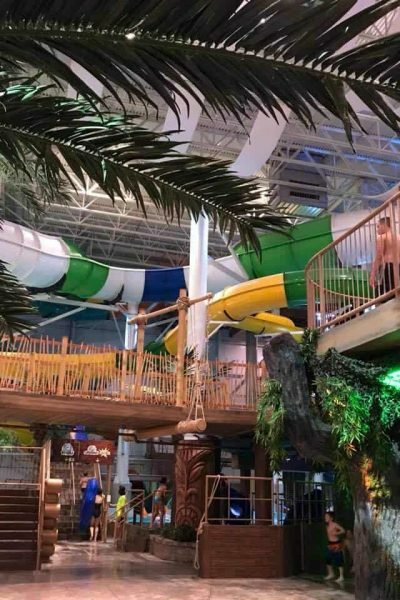 The Indoor waterpark is quite large! When you enter, you’ll only see a small portion of the park. With the tropical theme, there are areas hidden from view, which makes it seem quite large and helps to minimize how crowded the park can feel on busy days. The Enchanted Forest: this cute zone is tucked under the tub slides and near the entrance to the large raft slides. Head to the back of the park and to the right to find it. The forest is great for little ones because there is only one exit and entrance, a small slide and lots of water features to play. No standing water to worry with little crawlers (but be wary of the water dumping). 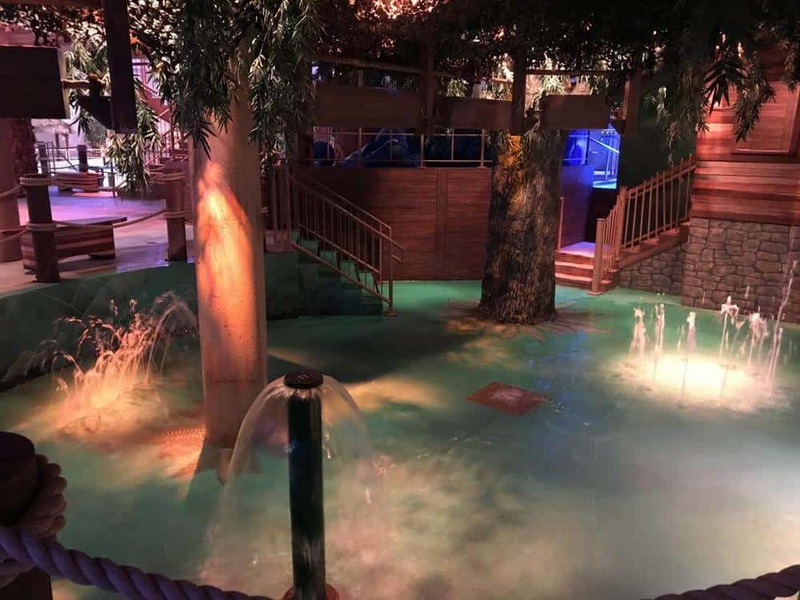 The entire area was clean, most of the water features were in working condition and the atmosphere was fun. The Reef: This is the most popular area for kids. 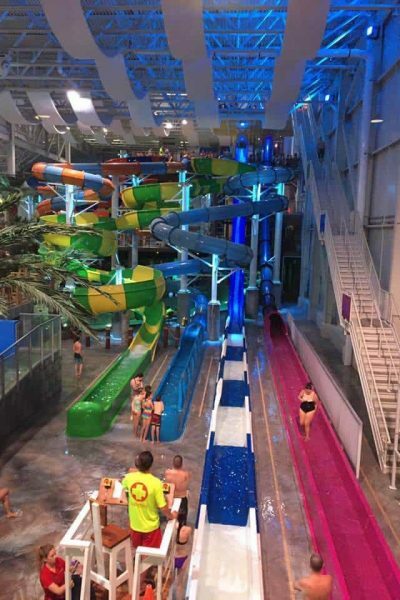 It features a zero depth entry with water prayers, a boat, fun slides (to go on their own) and easy visibility. We loved the interactive spray jets, play pads and fountains to explore. However, the larger pool is only steps away, so it’s best to use the provided lifejackets. The Plunge and Magma: These two wide family style slides are steps away from the Reef Zone. Children under 1.22 meters are welcome when wearing a flotation device and you can slide two at a time. These two slides were a favorite for my son. We went together quite a few times and then he enjoyed going on his own. 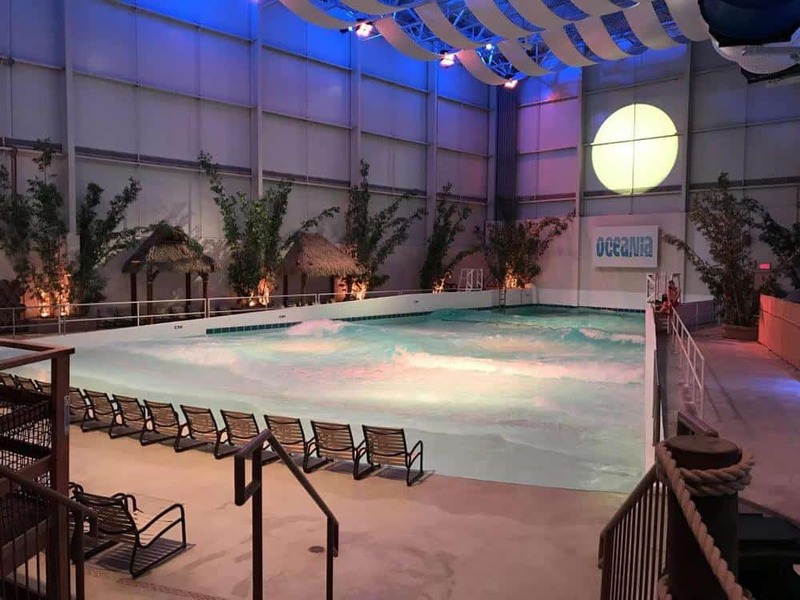 Oceania: This is the 4,000 sq foot wave pool. Note that children under the age of 3 are only permitted in the shallow end with a flotation device. There is a dark line at the bottom to designate the shallow and the deep end. If your kids are older than 3, then more of the park is open to explore. 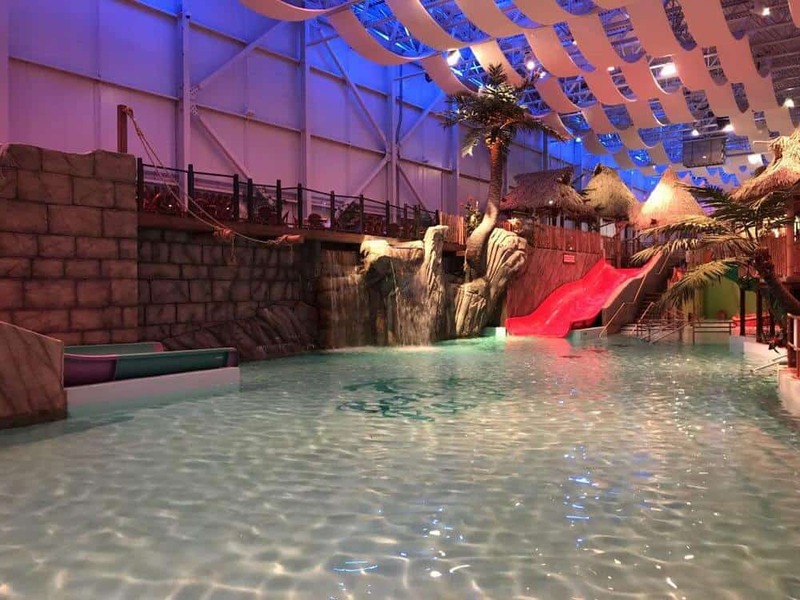 Riviera Lazy River: Grab a flotation device if you are under 48″ (1.22m) and enjoy the adventure of floating down this fun lazy river. With spraying jets of water, waterfalls, buckets of water dumping from overhead and cannons shooting from various play areas, it’s a wet ride. 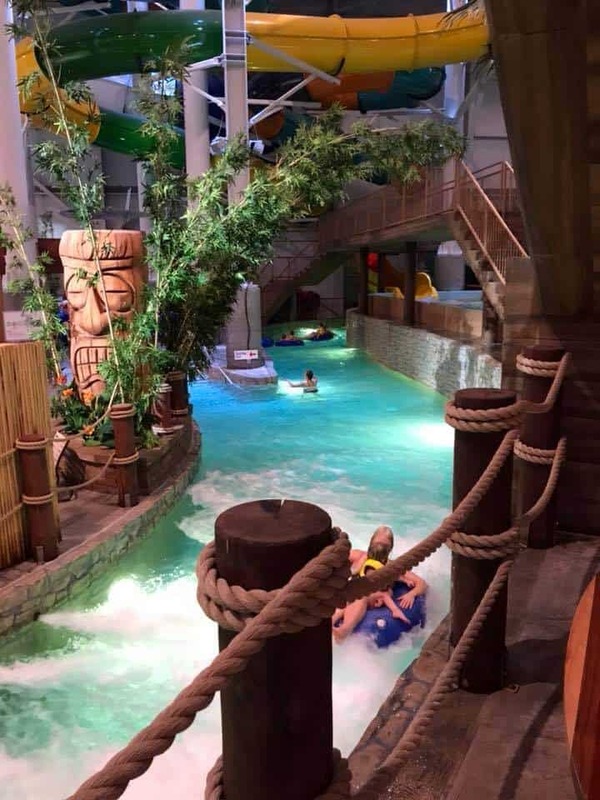 We’ve been to many water parks and this lazy river was a favorite. Serpentine: Check out five colorful and slippery slides winding through the park. Names after various snakes, Anaconda, Boa, Python, Viper and Cobra slides will delight you and your kids. Children under 48″ are required to wear a life jacket and you must ride with them. There is a choice between open top and closed slides, as well as shorter and longer slides. Plenty of options to keep everyone happy. Once your kids reach 48″, then a couple more options open up for them. Tribu raft ride: This ride is located at the back of the park. It requires a minimum of three people to ride. Since my son wasn’t tall enough, I made friends and joined in with another group. It was a fun ride, but nothing amazing. You don’t have to carry the large raft to the top, so that’s a bonus. Cyclone and Flash double inner tube ride: Both of these rides are two person inner tube slides. Be sure to grab a tube before you head up the stairs. 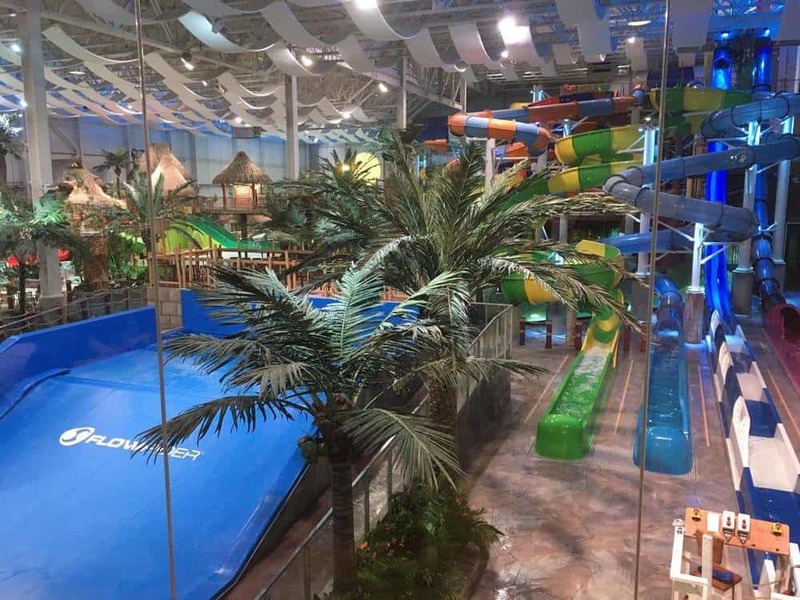 You’ll experience a tropical storm as you zoon down the slides to the large pool with a huge splash! If you like to make your heart skip a beat, then head over to the front of the park to check out Capsule and Chute Libre. These two slides will thrill you with a simulated freefall of over 15 meters high. You’ll enter the chamber, cross your arms and legs, say a quick prayer and off you go! 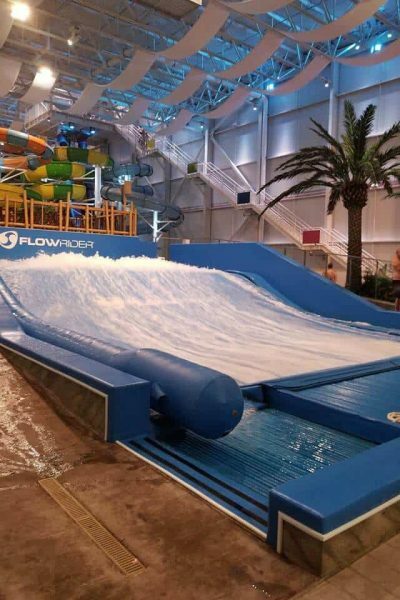 Lastly, be sure to check out the wave rider with multiple options to “ride” the waves from boarding boarding to surfing. Instructors are on hand to help you master the new sport. We didn’t take part in the fun, but we enjoyed watching others and their attempts to show off their new tricks. Looking for a place to relax? Head over to the Sauna (located at the top left section of the park). It is a bit tucked away, but if you see the stairs up to the cafe, you’ll see it just below. Note that children above the age of 5 are allowed to be in the sauna, so if you are looking to enjoy it with more adults, you’ll want to visit during the evening. It is a large sauna area with multiple jets, so hopefully you can find a spot to tuck away. There is a nice cafe/fast food style restaurant located just upstairs from the Bora Parc area. They offer the typical fare from burgers, chicken strips and poutine. For vegetarians, they did offer a spicy black bean burger. 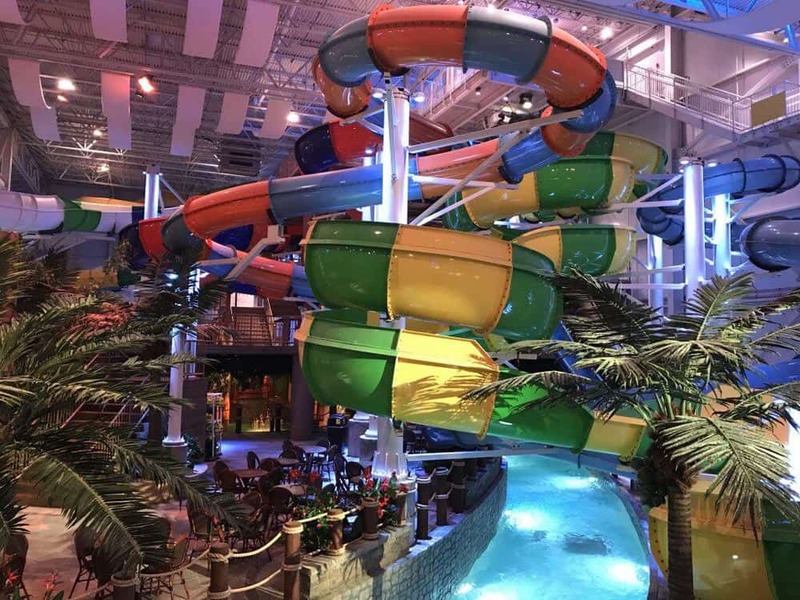 This is one of our favorite indoor waterparks due to the nicely heated indoor area, huge aray of water slides (with many that our son could enjoy), clean facilities and an appropriate level of chlorine. There were free floating devices to use and plenty of places to sit. 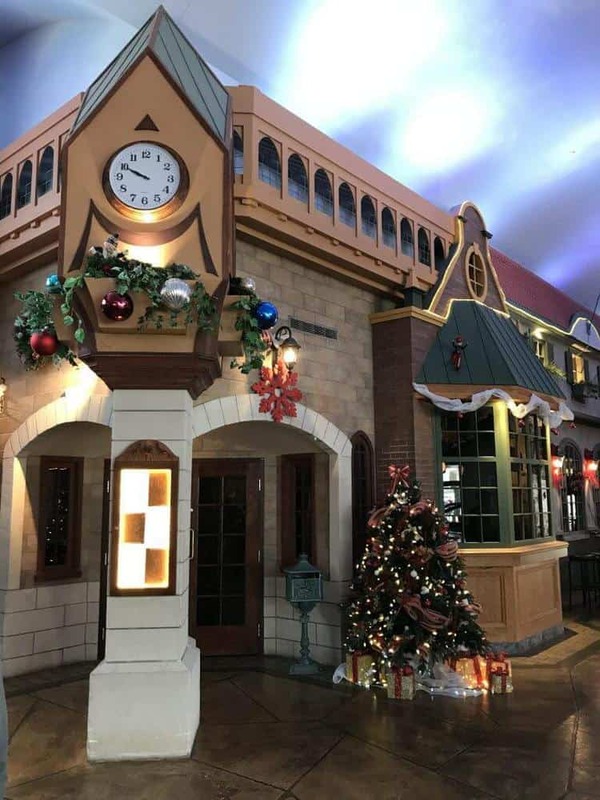 Valcartier Hotel and Village has multiple restaurants, but only a few are open during the Winter season. 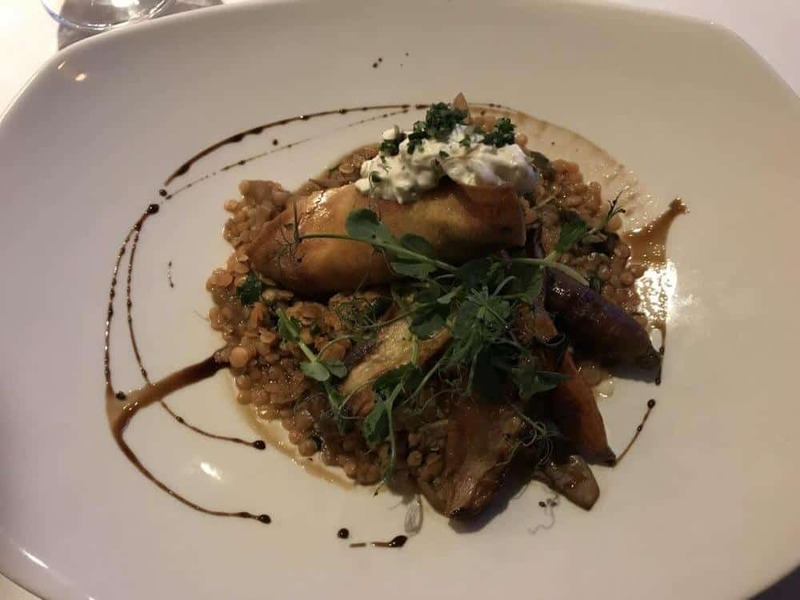 Since we stayed on the property, we tried out four of their dining options. I’ll include some details about each restaurant and what we loved/didn’t love about each one. I’ll also share one restaurant that we visited off the property. This restaurant is located close to the entrance to the winter fun park. 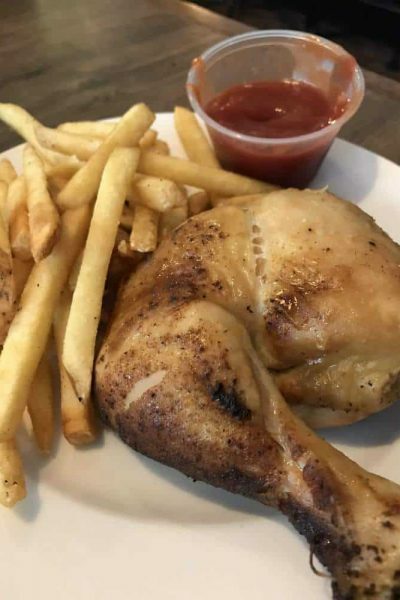 It is a family run restaurant that focuses on rotisserie chicken. We decided to dine here after a few hours at the snow tubing park. I did see some reviews on Tripadvisor that the service can be lacking and the waiting times can push the limit, but it was a slow day during our visit in mid-December. We thought the food was good and they had plenty of options for various diets and needs. My son had the rotisserie chicken kids meal, but it was a ton of food and could be easily shared. 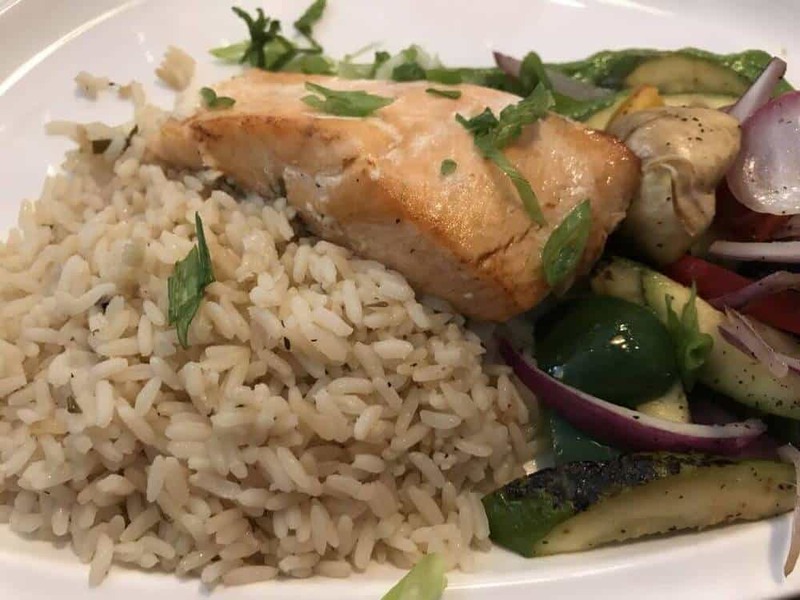 I had the salmon with pilaf rice and roasted vegetables. I thought everything was prepared well and tasted great. This is also the main restaurant for breakfast. We returned the following morning for breakfast and we didn’t have any complaints. We thought they had a good selection of options and ordered off the menu. 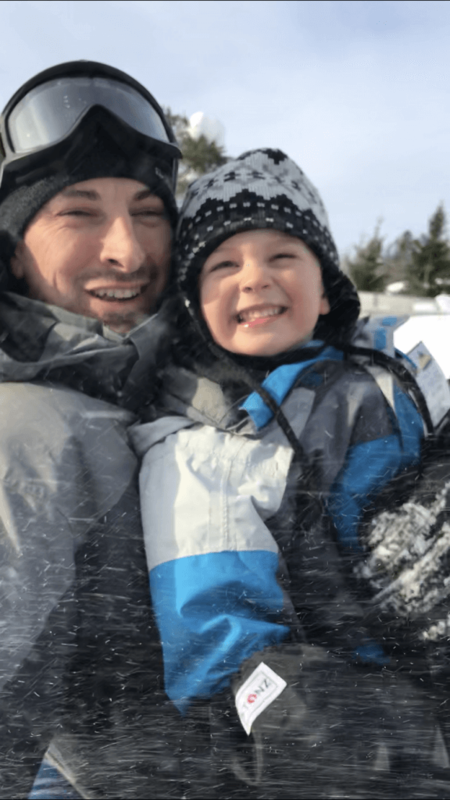 If you are looking for a quick bite to eat after a morning of fun at the winter snow park, then this cafe is perfect. It is also located just inside the entrance of the snow park. It features grab and go type foods like fries, poutine, hamburgers and hot dogs. You’ll order at the counter and then find a seat to enjoy a quick meal. 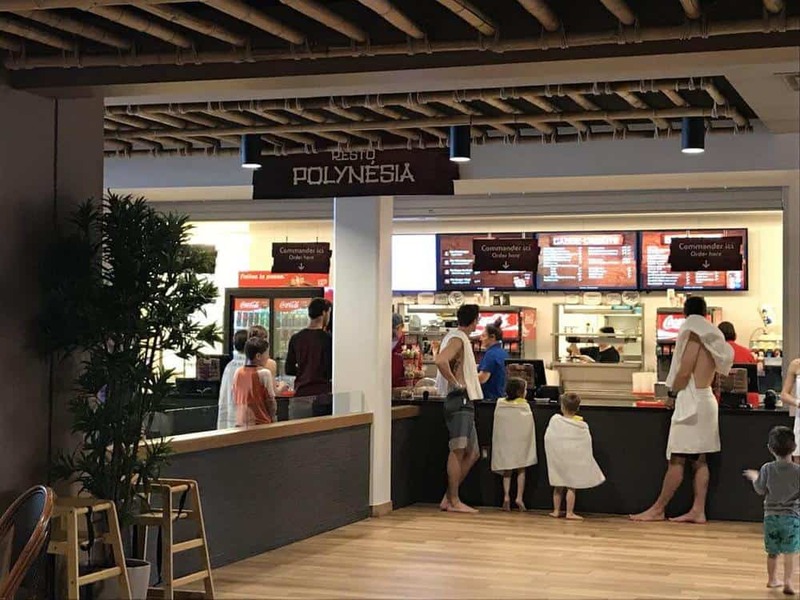 This is the restaurant connected to the Bora Parc indoor waterpark area. Another grab and go type of place. Similar fare to the Cafe Etcetera. Check out my in-depth review of the restaurant in the Bora Parc section above. This is the 4-star gourmet restaurant at Valcartier. 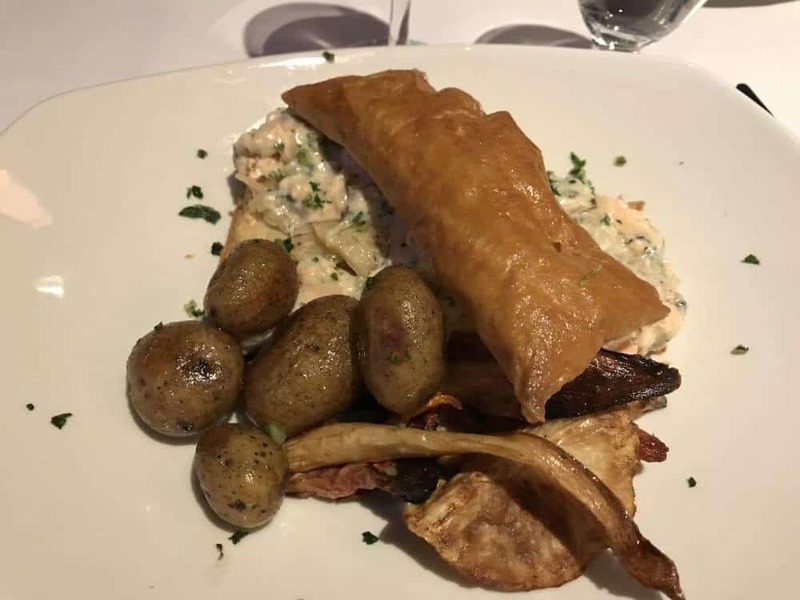 They feature steak, fresh seafood and other dishes prepared by the chef. 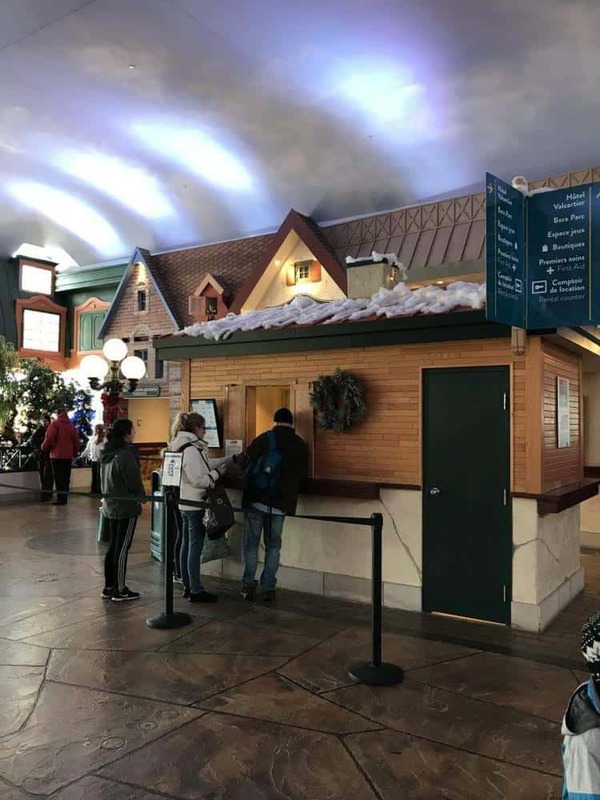 The restaurant is located in the indoor village near the ice skating and outdoor winter park. It was only open for dinner during our visit. The wait staff was attentive and we found kid friendly dining options for our son. We ended up ordering the soup of the day (vegetable soup), the green salad and the salmon dish. Everything was delicious! 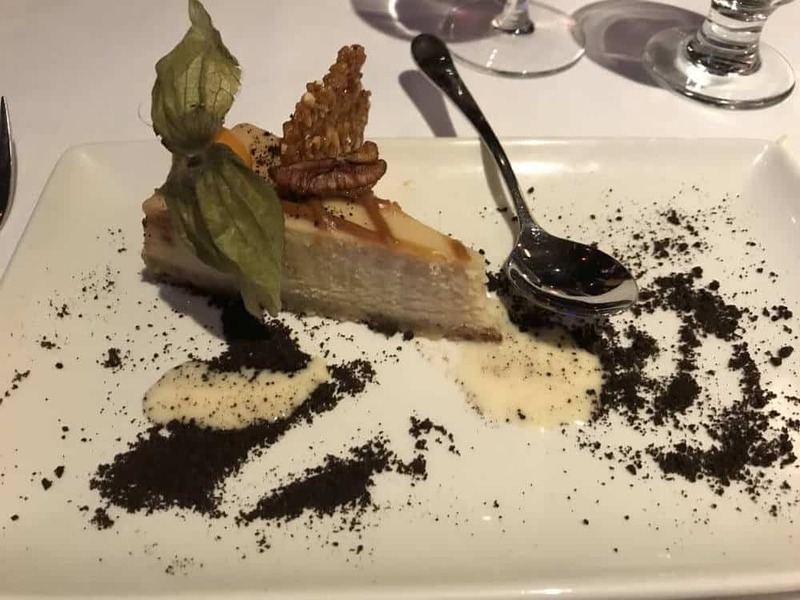 Be sure to enjoy the deserts and wine. This is the only restaurant that we tried that was located “off property”. It is a local type of place with a bar and pub style feel. It was super quiet when we went, so we really enjoyed chatting with the gentleman who was working that night. 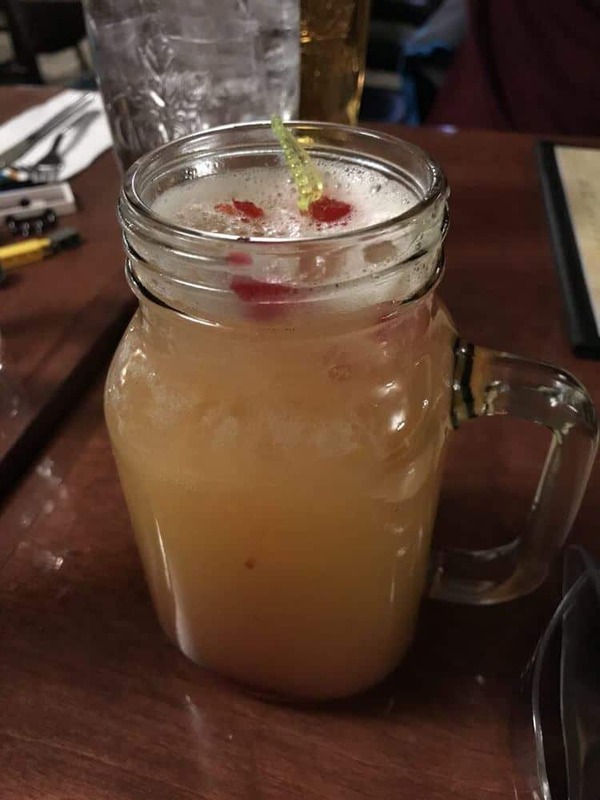 He made me an amazing drink (I asked for seconds) and the pizzas were wonderful. 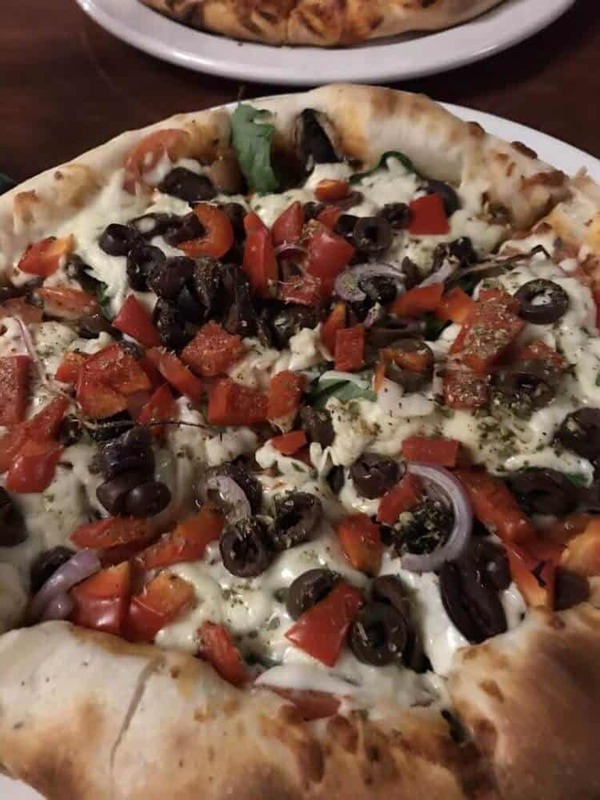 If you are looking for a laid back place to enjoy a great beer and some pizza, be sure to drive the two minutes down to road to check out Pub St-Gab. 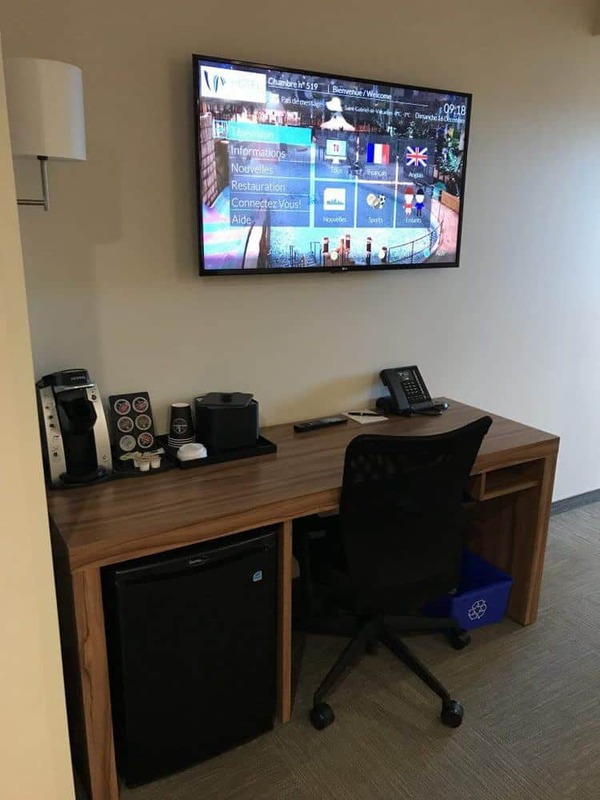 If you are looking for more things to do at Village Vacance Valcartier, be sure to check out their digital games room. 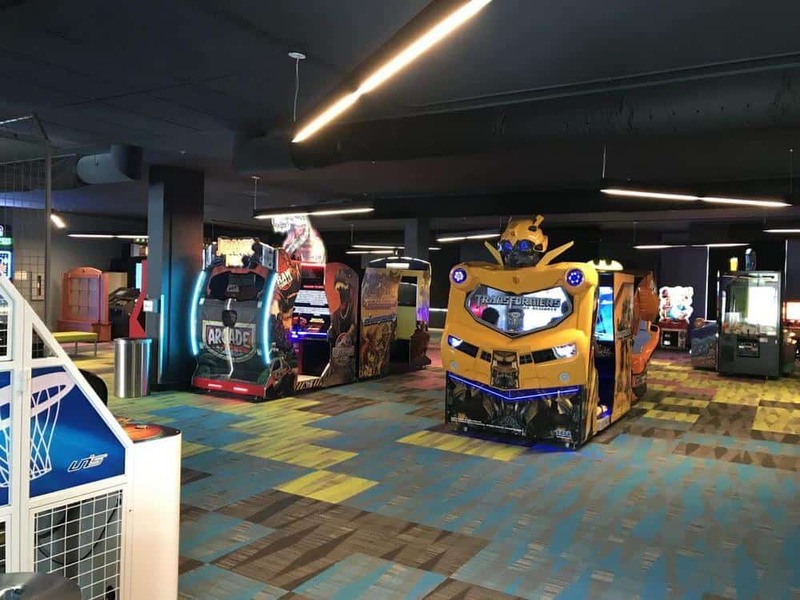 You’ll load up a plastic playcard and use this card to play a variety of games in their 10,000 sq foot indoor play zone. There is everyone from car racing, pinball (my favorite), basketball, table hockey, a dance floor, simulators and more. Certainly something for everyone and our preschooler found plenty of fun. 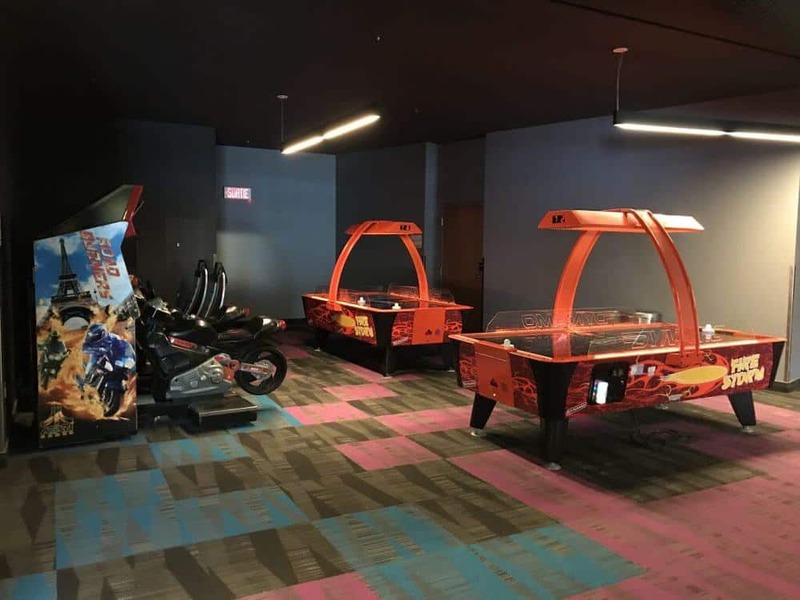 The games room is located on the 2nd floor and is not far from the entrance to the Bora Parc indoor waterpark. We had a wonderful visit to Valcartier Hotel and Village. 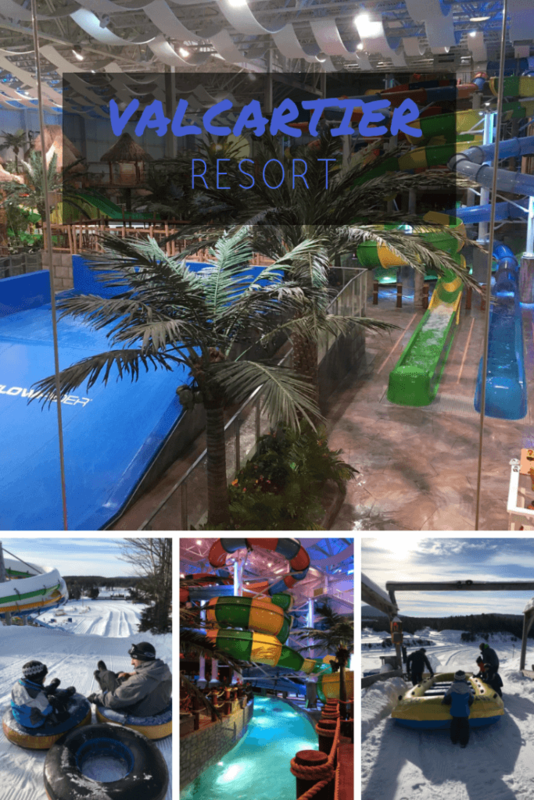 It was the perfect place to spend some family time playing in the snow, hitting the waterpark and lounging around the room. The staff was all helpful and informative about the hotels amenities. Ready to book your stay? Head over to booking.com! Be sure to check out their hotel suites with a hot tub on the deck!! Be sure to leave me a comment or send me a message with any additional questions. We’ve traveled quite a bit and we really enjoyed our visit to the Village Vacance Valcartier. Ready to read more about Quebec City? Head back over to my post about our first three days in Quebec City. Or perhaps you are ready to read about more of our adventures, head over to our interactive map where you can see where we’ve traveled (or what we written about thus far). Thanks so much for reading! Pack More Into Life makes use of affiliate relationships with merchants for monetization. This means when you click on links to various merchants on this site and make a purchase, this can result in a commission that is credited to this site. Some affiliate programs and affiliations include, but are not limited to, booking.com, Amazon and others. Thank you for your support with the cost of running this website. Never heard of this place. It looks fantastic! I will definitely save this for future travel as Quebec City is on my list of places to visit in Canada and Bora Parc Valcartier and the village sound perfect! This place looks awesome. Quebec City in general had always been on our bucket list when living in NY but we never made it there. We are likely moving back to NY soon so this place is on the top of my list as a place to visit!! How perfect for the kids and adults alike! Some great tips here! Love how detailed this is! That looks amazing! Really hope we can incorporate Canada into our next trip west so we can visit!